If you go to New York Times and then visit Washington Post — there’s a stark difference in designs for both sites. And this authentic difference is what helps to separate sites from one another, in a truly meaningful way. The goal of WordPress themes — and hence their popularity — is to do exactly the same. You want to have a beautiful magazine design for your magazine blog, because it separates your site from others. Magazine 7 is based on concepts like trendy, modern, flashy, yet simplistic in its workflow nature. 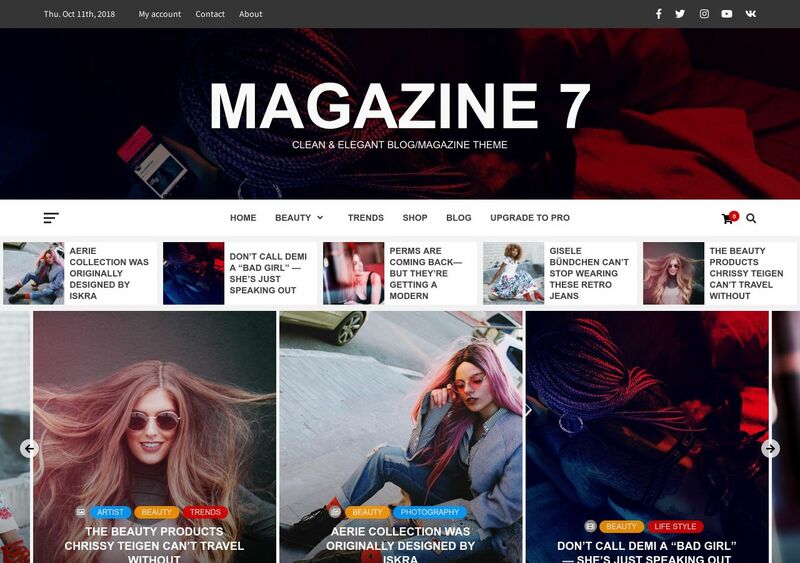 Whether it’s the latest celebrity news you wish to highlight, or write about the latest fashion trends — we believe that Magazine 7 fits in these categories perfectly. The fonts, the post sizes and imagery presentations are all aimed to captivate readers attention. And even then, browsing a site built with Magazine 7 theme feels simple. There’s no annoying elements that get in the reader’s way of enjoying your crafty content.